Every town, every place and every person has a history. Maps reflect the appearance of ever-changing towns, and maps from the past capture those transitions. Walking around a neighborhood becomes a whole new experience when you learn the historical paths of the place. What the scenery expresses becomes richer when you notice vestiges of the past and visualize how people once lived their daily lives. By pondering the creativity and will the mapmaker put into a map—and how the map was used—you can understand the map’s depths. What fascinates people most about ancient maps might be that these maps created for practical purposes continue to have value as guides, even after their mission as maps has been completed. We hope that becoming familiar with ancient maps will unravel the past of these neighborhoods, and serve as a catalyst and means for thinking about the future of the place. In the Edo Period, maps were essential for exploring towns because addresses were not systematized and samurai residences had no nameplates. Maps had to be carried and spread out to view street locations, which led to the creation of many innovative maps such as categorized maps, booklet types and folded types. Under these circumstances, sectional maps—a type of categorized map—were produced. The map covers the area from Asakusa and northern Shitaya to Minami-Senju and Nippori. Kinryuzan Senso Temple, the oldest temple in Edo (old Tokyo), is depicted at the lower left. Ukiyo-e, a type of pictorial art developed in the Edo Period, has two types: nikuhitsuga (paintings) and nishiki-e (woodblock prints). 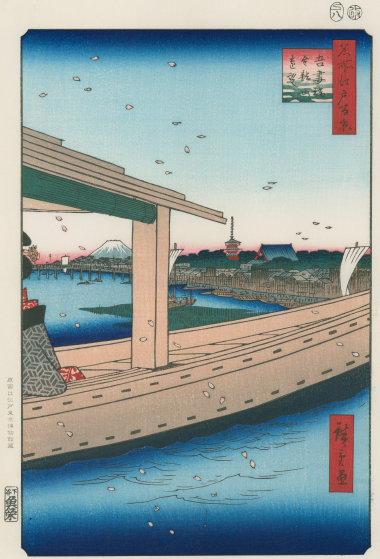 Woodblock prints could be mass-produced, and many still survive. Portraits of kabuki actors and other people, prints that had stories as their subject matter and prints of well-known locations such as shrines, temples and leisure spots account for many nishiki-e. The portrayals of various aspects of the four seasons, the passing of time during the morning and evening hours, the bold compositions and richly lyrical depictions of the moon, rain, snow and wind are their charms. Nishiki-e were synergistic works of art produced through the collaboration of the artists who drew the pictures, those who carved the woodblock prints, the printer and other related artisans, as well as the publishers who supervised everything from planning to production and sales, and were beloved as a medium by the Edo masses. Not only were they popular among the people of Edo and travelers, they also became known worldwide since they had a great impact on artists such as Monet, van Gogh and Whistler. The lovely multicolor printing techniques used to create nishiki-e were also employed to make maps. 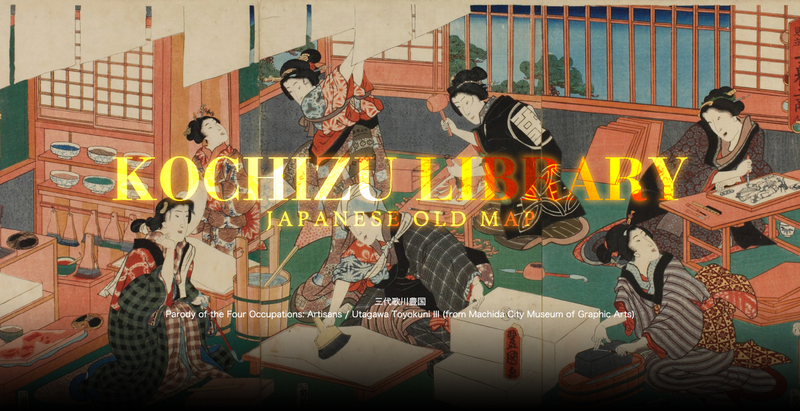 Beautiful maps that were elaborate and also of aesthetic value were printed in great numbers, and served as Edo souvenirs for the samurai and merchants who visited from around Japan. 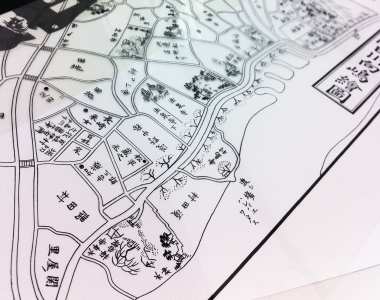 From 1965 to 1984, map publisher Jinbunsha Co., Ltd., reprinted many ancient maps with the help of local history experts. Those suitable for reprinting were chosen from the company’s collection of original maps and then photographed, then traced based on each color ink block. For sections where words were unreadable due to wear and tear, other historical resources were used to decipher the words, which were then added to the map with great precision. 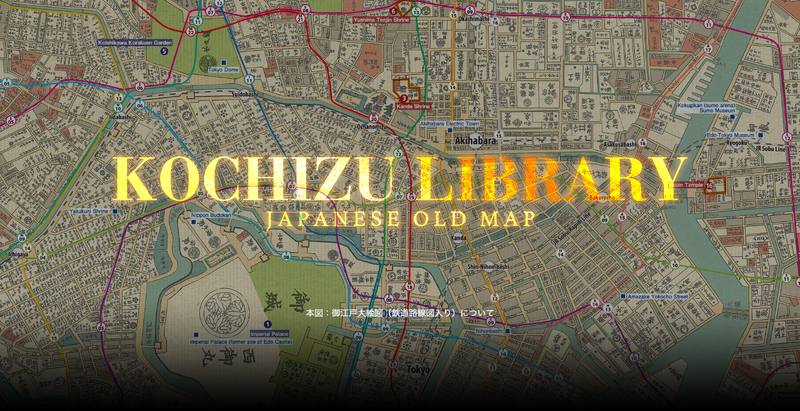 These restored ancient maps were printed on special paper, becoming Jinbunsha-ban fukkoku kochizu (Jinbunsha reprints of ancient maps). 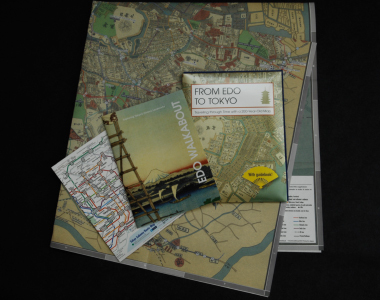 This set features the Illustrated Map of Edo—which superimposes a current rail line map over an ancient map of Edo—and the guidebook Edo Walkabout. In addition to descriptions of twenty temples and shrines and twenty daimyo gardens, Edo Walkabout also includes guides for present landmarks and tourist attractions. A subway map of Tokyo is also included. Contained in an exquisite package, this set is perfect for overseas tourists and as a souvenir from Edo (Tokyo) to bring when traveling on business overseas. The main publication contains descriptions of sixty-two shrines, temples and daimyo gardens that convey the vestiges of Edo to the people of today. It also includes a reprinted ancient map with current train and subway routes superimposed on it to make it easier to compare past and present locations. This bundle is a must-have for historical strolls where you think about the historical trail of the neighborhood, daily lives of the people who used to live there, and the future. An ancient map was re-created for this publication’s illustrated Edo supplement. We added subway and train line maps and modern landmarks to make it easier to compare what is seen in the present day. 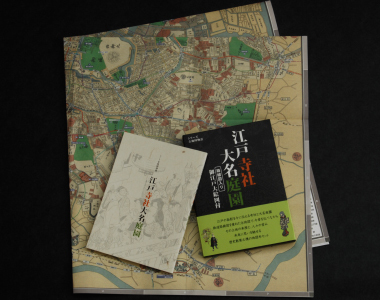 The original map was produced in the fourteenth year of the Tenpo Era, 1843, by yomihon (reading book) writer Takai Ranzan, and published by Okadaya Kashichi, a book dealer located in front of Shiba Shinmei Shrine. A colorful woodblock print reproduced in six colors—red, blue, yellow, green, brown and gray, and printed over India ink—the map portrays picturesque shrines and temples as well as the city’s topography. People prized the map for ornamental purposes because of its fine appearance, not just its practical utility, and it was also a popular souvenir of Edo for merchants and the servants of samurai. Maps were in high demand among the many people who traveled through Edo, and new editions were issued constantly in response to the city’s often bewildering changes. A large map at around 122 by 148 centimeters, the original was drawn with west at the top. 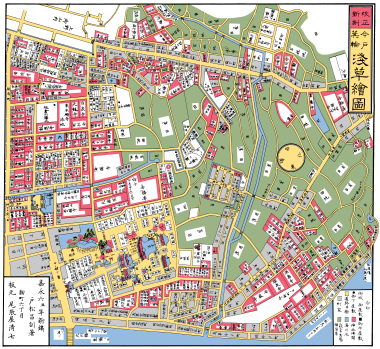 The map grows more distorted near the edges, but the middle section is illustrated comparatively accurately and is a complete map of Edo suited for comparisons with present-day Tokyo. ©2015 Kochizu Library Co., Ltd.